High clinical effectiveness of Medical Massage, when it is correctly practiced, brings to the clinic a large number of very complex cases since many desperate patients try to find solutions to their pain and suffering while everything else they tried already failed. We observe that in our practice as well as in clinics of our former students who successfully practice Medical Massage around the country. This case is perfect illustration of that. Approximately two months ago we had new patient in our clinic. She is 52 years old, physically fit female who complained about acute pain in the left neck, upper shoulder, severe restriction of cervical rotation to the left, pain in the left shoulder joint, left side headache and weakness of the left arm. She had these symptoms on and off for approximately last 5 years and went through all therapies available without stable results. Her PCP suggested to see pain specialist and only solution which was offered to her was opioids prescription. She completely rejected this proposal. Her friend and our former patient tried for long time to convince her to visit our clinic, but she always declined it by saying that she already wasted a lot of money of massage therapists, chiropractors and physical therapists without any success. Finally, our former patient succeeded and that how she got to our clinic. During clinical interview we learned that she owns small company which puts irrigations systems in backyards and she thinks that recent flare up was a result of her digging trenches due to employee shortage. The large scar on her neck indicated extensive thyroid gland surgery. Indeed, according to the patient 5 years ago she had thyroid cancer and left half of her thyroid gland was removed. However, two days the surgery was repeated since pathology report indicated that surgeon didn’t get clear margin first time. During second surgery her entire thyroid gland was removed. Following second surgery she developed extensive keloid scar and in attempt to soften it scar was injected with steroids, but it didn’t work, and she had two plastic surgeries to make scar cosmetically acceptable. Fig. 1 shows picture of our patient’s anterior neck. The large horizontal scar runs through her entire neck. During the visual observation of anterior neck and shoulders it was obvious that her left upper shoulder is elevated and there is up to 30% increase in thickness of the muscle mass on the left anterior neck (see Fig. 1). Since the patient is right handed her right anterior neck should be 15-20% larger than left while it is obvious from the picture above that her left anterior neck is at least 15% more prominent. Wartenburg’s Test – extremely positive with pain and numbness shooting down to the patient left arm, forearm and thumb. Sensory Test indicated that she has sensory deficit within radial and axillary nerves distribution. Movement Test exhibited weak hand grasp especially by her thumb. 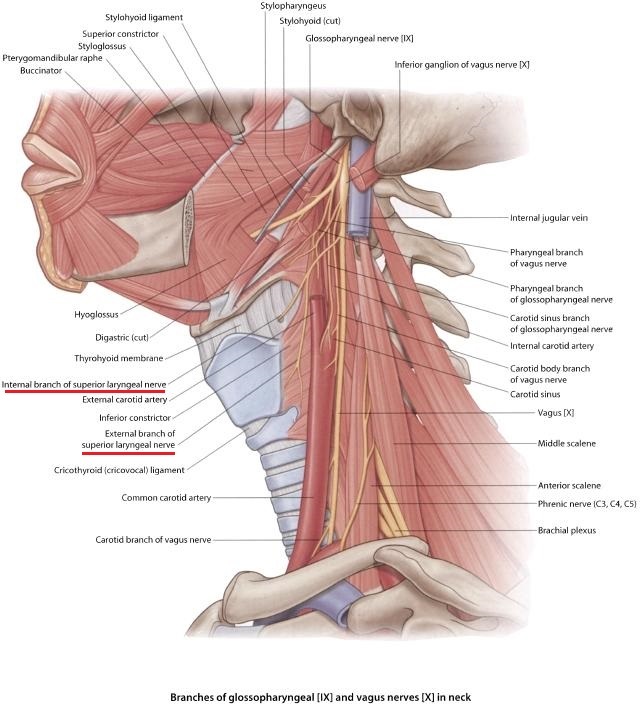 All of these indicated the significant compression of the upper part of the brachial plexus by Anterior Scalene Muscle with secondary symptoms of Axillary (pain the left shoulder joint) and Radial (pain in the neck, upper shoulder and down to her thumb) Nerve Neuralgias. 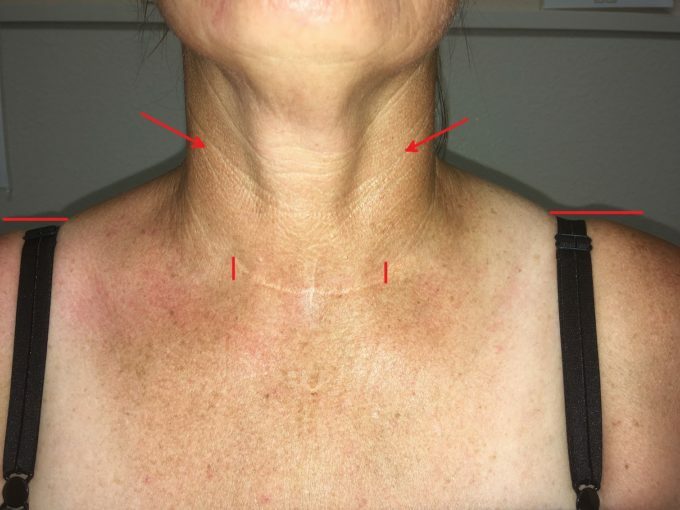 Considering the size of the scar, repetitive surgeries and start of her symptoms after the neck operation it was more likely that scar tissue in the area of the thyroid surgery was reason for the tension developed in left ASM and that was initial trigger of her symptoms. Based on results of the evaluation we started with application of Medical Massage protocol for the Anterior Scalene Muscle Syndrome. The treatment targets posterior neck first since it addressed origin of ASM’ innervation before moving to the anterior neck and work on ASM directly. To decrease protective muscle tension in the posterior cervical muscles and inhibit pain analyzing system as a part of the treatment we use electric vibration. As soon as massager was placed on the left posterior shoulder the patient almost immediately started to cough spastically. Interesting enough she started coughing (less intense) even if electric vibration was applied to her right upper shoulder (see video below). Such a reaction was clear indication that scar tissue and/or tension in ASM irritates the patient’s superior laryngeal nerve which is sensory branch of vagus nerve. Normally this nerve is located on the thyroid gland and it triggers coughing reflex when it is irritated by direct pressure (in case of our patient by vibrations) or when sensory receptors in the larynx, trachea and bronchi are activated by various irritants (dust, fumes, smoke etc.). Fig. 3 illustrates anatomy of superior laryngeal nerve. Considering cough reaction to even distant application of vibration we added work in the area of scar to ASM protocol. Immediately after the treatment the patient felt significant decrease of pain intensity in the left neck and upper shoulder and increase in cervical rotation to the left. After finishing the session, the patient was advised homework and she was informed that since she has significant tension in the anterior neck there is a very big chance that she will have extra uncomfortable sensations next morning. The patient scheduled for the second session in a day. When she came to clinic for the second session it was obvious that she was no at ease. Her answer to the question “How are you doing?’” triggered very unusual response. She said that she is very afraid of the treatment, and that initially she didn’t even want to come because of what happened to her next morning after first session. We expected that she will complain about extra pain and discomfort which was expected, but instead she said that after she woke up next morning she completely lost ability to swallow any food. The only what she was able to swallow was her own saliva and little amount of water. After two hours of repetitive attempts, she really panicked and decided to go to emergency room. Just before she and her husband were ready to leave she noticed that her swallowing slightly improved and eventually it was restored. She decided to come back to the clinic only because she felt significant pain relief in the neck and shoulder pain she didn’t feel for last couple years. The patient’s next day reaction to the first session completely changed priorities in the therapy. It was obvious that scar itself, her hyoid bone as well as larynx must be addressed first, but it was tough sell to the patient because she was panicked even with thought that what she experienced may occur again. She was really taken by surprise that we asked about her voice. She said that initially friends who didn’t see her for a while after the surgery mentioned that she now speaks now with lower voice. Using this piece of information we explain patient what did happened and how we can help her. She reluctantly agreed. Evaluation of the hyoid bone showed that soft tissues around it were so tight that bone almost lost its ability to be shifted laterally. We now concentrated on the anterior neck only. We started working with scar applying skin kneading, stretching and skin rolling in different directions. 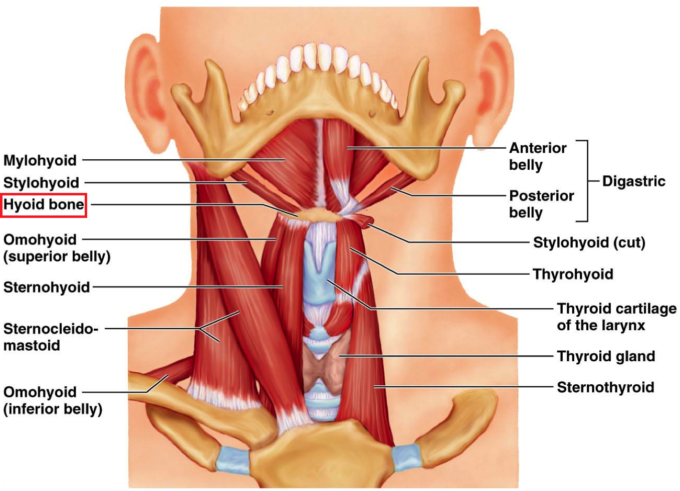 To reduce tension in the soft tissues around the hyoid bone we worked on the small muscles which form our mouth floor and at their insertion into the upper edge of hyoid bone (see Fig. 4). We used draining effleurage, gentle circular friction, pinching kneading. To reduce tension in thyrohyoid membrane we applied gentle repetitive compression below hyoid bone in the narrow space between bone and thyroid cartilage. Next, we stretch soft tissues inserted into the hyoid bone by moving it laterally in both directions during the patient’s exhalations. At the end using thumb and index fingers placed on the sides of hyoid bone we stabilized it and asked the patient for repetitive swallowing while trying to resist bone elevation during each swallow. At the end of this modified session the patient was in tears of how light her entire neck feels. We informed her that there is large possibility that she may experience difficulties with swallowing next morning. At the beginning of third session she was very happy because she felt only residual pain in the left arm and shoulder and while difficulties with swallowing indeed appeared in the morning they were gone in half an hour after she took hot shower and stretched. After 4th session the patient reported that her swallowing didn’t changed next morning, she doesn’t feel any pain of discomfort in the left neck and upper shoulder anymore. Also, no headache. One more session to give better stability of clinical results was performed and the patient was scheduled for the appointment in two weeks. We saw the patient two weeks for follow up. She did her homework regularly and she doesn’t have any pain and discomfort in the neck, upper shoulder and arm. However, the really interesting change is that she started to get her normal voice back. Even her husband noticed that she speaks now with higher voice and she was very exciting with this new and unexpected for her development. 1. In every case of chronic pain the therapist faces chain of pathological events which needs to be understood. Only in this case he or she is able to choose correct treatment to help the patients. Let’s place all events of this clinical case in consequent order. Repetitive surgeries and steroid injections —-> formation of extra scar tissue on the anterior neck and its hardening —-> mild irritation of superior laryngeal nerve —-> increased tension of the mouth floor muscles above hyoid bone —-> restriction of hyoid bone mobility during the swallowing —-> changes in the tone of voice due to the pressure on the voice box —-> increased tension in the left ASM —-> irritation of the upper part of brachial plexus —-> tension in the muscles innervated by the affected part of the brachial plexus —-> acute pain in the left neck and upper shoulder and cervical ROM restriction. With this complex chain of event the actual symptoms which brought patient to our clinic were pain and discomfort in the left neck, shoulder and arm. In majority cases of chronic somatic abnormalities, the therapists face multi-layered pathology and only its elimination layer by layer gives stable clinical results. 2. If therapist blindly follows the patients’ complains without evaluation of the soft tissues on layer by layer basis he or she will frequently address the secondary syndromes instead of identifying initial trigger. In majority of chronic pain syndromes what is on the surface is not what needs to be treated first, since real trigger is frequently hidden in the completely different part of the body. Our patient didn’t complain about any discomfort in the anterior neck. Instead all her symptoms were in the upper shoulder and neck. It looks that everyone who treated her before followed her complains and it only patched her problems. 3. If new and sometimes unexpected symptoms (disruption of swallowing in our patient’s case) appear during the treatment they need to be immediately addressed and treatment strategy adjusted. Such new developments pop up because the compensatory reactions developed by the brain to coupe with somatic abnormalities were removed during the therapy and hidden sometimes even more complex problem now fully surfaced. 4. Why our patient had swallowing problems of such intensity? Such look like simple act as swallowing is a result of complex coordination between many structures and it clearly splits in three phases: oral, pharyngeal and esophageal. In our patient pharyngeal phase was greatly affected. First let’s examine anatomy of suprahyoid muscles presented in Fig 4. The hyoid bone (in Fig. 4 it is emphasized by red square) is only bone in our body which is not attached to any neighboring bones. It is suspended on the anterior neck and its position is controlled by tension and sophisticated coordination between suprahyoid muscles. Just before bolus of food enters pharynx, epiglottis must close larynx to prevent food or liquid entering voce box and later trachea. In such case we experience so called physiological apnea or stop of breathing every time we swallow the food. For bolus of food to proceed further down, the pharynx needs to be widened and elevated. It is done by muscles which form floor of the mouth: suprahyoid, digastric, stylohyoid etc. Critical element of this process is elevation of hyoid bone. In our patient as a result of repetitive surgeries and scar tissue development the intimate coordination between anterior neck muscles including suprahyoid muscles was affected and to deal with it brain adjusted their actions while the normal elasticity was sacrificed and changed as result of protective muscle tension formed secondary. First treatment session decreased protective muscle tension on the anterior neck and it left motor cortex confused for some time before it was able to regain full control over the action of suprahyoid muscles. The patient felt it as a problem with swallowing she didn’t have before first session. Her repetitive swallowing attempts in the next morning gave time to the motor cortex to restore full coordination between suprahyoid muscles and they reestablish normal elevation of hyoid bone during each swallowing. Suprahyoid muscles when exhibit tension may also elicit pressure on voice box and it can contribute to the change of the normal tone. As it was shown by Sullivan et al., (1997) the massage therapy reduces tension in the laryngeal muscles, restores their coordination and brings back the patient’s normal voice. This is exactly what happened to our patient as well. Sullivan, S.J., Blumberg, J., Lachowicz, C., Raymond, D.: Does Massage Decrease Laryngeal Tension in a Subject with Complete Tetraplegia. Perception & Motor Skills, 64: 169-170, 1997.